Grittys I think you're talking about The Sports Page which is where Bananas used to be, near the new hilton. I haven't actually been, but my sister lives out that way and was telling me about it. I guess the new owners gutted Banana's and threw over 4 mil. into the place, including 500,000 on just plasma tvs. The downstairs is going to be a martini/yuppie bar that opens in Sept. I checked out the menu and it seems pretty reasonable, i'm interested to see how much their drinks go for. Also pretty good beer selection, 14 taps. Developers have finally obtained all the necessary approvals to begin cnstruction of a new building on the Portsmouth waterfront. The proposal would eliminate parking in front of and on the side of an existing apartment building and replace them with a mixed use structure, housing retail and restaurants on the first floors with offices and condos above. The building would replace the only remaining break in the streetscape on Bow Street. To me it sounds like a win-win,- lose two parking lots and have them replaced with new mixed-use structures. But in Portsmouth, it's had a real hard time coming through. A lot of Portsmouth people have escaped the higher costs there and moved to Dover. Now it's the biggest town on the seacoast. -- Elements proposed: Public waterfront park; 40,200 square feet of retail/office space; a 5,000-square-foot restaurant; up to 184 condominium units. -- Public Park: The layout of roughly three acres of park land is still up for discussion. The waterfront committee is looking for ideas from the public. -- Hurdles: More negotiations are needed before the project can move forward. Also, odor from the city's pump station needs to be addressed and the Washington Street bridge needs to be built. -- Bottom line: The new development is projected to add $1 million in new taxable revenue. The project is also expected to bring between 350 and 400 new residents to the city. Once the bridge is under way, construction could start within a year and a half. DOVER ? One firm's vision to develop the waterfront includes more than just condominiums. They boast a proposal that intertwines with the city's thriving downtown and offers more green space along the Cocheco River than Henry Law Park. Dickinson Development, which designed and built the Jordan's Furniture and I-Max Theater in Reading, Mass., hopes to develop the roughly 30-acre Cocheco River waterfront. Representatives toured the city Thursday, pitching their plan to a number of local groups, including an editorial board at Foster's Daily Democrat. During that meeting, Mark Dickinson and his firm explained a new plan for the space, including the construction of a public waterfront park, roughly 40,000 square feet of retail/office space, up to 184 condo units, a wide boulevard and infrastructure to serve the needs of the area. The Massachusetts firm then met with Dover Main Street and ended their day by taking questions from the entire 13-member waterfront committee. Dickinson's firm comes to the table with more than 20 years and 3 million square feet under its belt. The more than 25-year-old company has developed office parks, shopping centers, hotels, and industrial buildings throughout New England and Florida. The pitch: "This is Dover"
Dickinson's firm considers the waterfront development to be an extension of downtown. The firm tried to give the development a Dover feel, with the proposed Washington Street extension forming its core, with residential streets radiating from it. The retail and office spaces would be positioned off of Washington Street, allowing for easier access and more parking, they said. The firm made its point using an aerial photo, which superimposed a concept plan over the currently vacant riverfront property to show how the model fits and matches the existing city. Their goal is to have a residential neighborhood buffered with retail and office space along Washington Street. To access the site, residents and visitors would cross a Washington Street bridge, which does not yet exist, but is part of the state's 10-year transportation improvement plan. The company removed a proposed extension that would have connected the development with Washington Street, through Maglaras Park and onto Henry Law. The project's 120 foot strip of green space will connect with space in Henry Law Park, weaving the complex into the fabric of downtown. The initial design had much less space and was structured to devote the prime realestate to condominiums. The make-up of the park has yet to be determined. The waterfront committee plans to solicit public input on the new park, which would be larger than the existing Henry Law Park. Dickinson said he is willing to make a contribution to any plan the city decides upon, but said the city may need to fund some of the work, depending on what the final plan. "A park can be a $1 million; a park can be $20 million," Dickinson said. The company is willing to help, but within fiscal reason. Dickinson stressed this plan is an example of what Mass. calls "smart growth," which allows for the expansion of the urban core in order to make more room for people to live closer to services in the city center. It would further add to the mix of uses in downtown and add between 350 and 400 new residents. Dickenson hopes the development will spur further growth in downtown on both sides of the river and has already begun discussing a new hotel with local property owners. Design for the condominiums incorporates turn of the century Queen Anne look details, including dormers, bay windows, shingles and a mix of textures and colors similar to those that already exist inside the city. Each of the three story buildings will be set between 4 and 5 feet off the ground, allowing residents to enter their homes by walking up a short flight of stairs. The extra height will allow for the construction of underground parking. Each of the units will have two spaces: one outside and another under the building. The underground parking is accessible via garage doors on the ends of each building. Each condominium will be listed at $400,000 ? a price Dickinson's marketing study found would appeal to people aged 45 to 60 and who make roughly $75,000 per year. Their study indicates there are roughly 5,000 people within 15 miles of the site that would fit that demographic. The mix of the units might change, but the development includes 184 two-bedroom units at 1,400 square feet each under the current proposal. Dickinson said the market might drive a mix of one, two or three bedroom units, allowing for a range of consumer options. The proposal no longer includes a marina or a hotel, although a small public dock is planned. The dock will make use of an existing rocky outcropping and allow another public access tot he river. The project will be conducted in phases. Work will begin with sections abutting the Washington Street Extension, then moving to units closer to the water. Dickinson stressed that while the later phases will likely be condominiums, the market could dictate otherwise and shops or galleries could be built on the lower floors. While Dickinson plans on completing the entire development, the phase approach would allow another developer to finish future work if prematurely Dickinson withdraws. Dickinson told the committee Thursday night he is young enough to finish the project, but old enough to not have to. The firm submitted its initial proposal to the committee in March. The proposal was initially met with reluctance because some felt it had the feeling of a "gated community." Members were also concerned about the lack of public access shown in Dickinson's initial proposal. After the that proposal, the committee continued to meet with Dickinson and discuss the project and the city's needs. Dickinson said Thursday the company heard those concerns and the new plan was drafted in an effort to make the development more a part of Dover. The Core Committee met this Sept. 26 behind closed doors and agreed to move forward in negotiations with Dickinson Development. The committee approved sending a letter to the Dover Housing Authority recommending that it designate Dickinson as the developer that the committee will enter into negotiations with for purposes of waterfront. The next step is for the committee to finalize terms and sign a purchase and sales agreement. The Housing Authority has the final approval of the project. Should an agreement be reached, it would be at least a year and a half before they could break ground. From there, they expect needing three to five years to finish. The committee also plans on having a public hearing to get resident's feedback. A specific date has not been set, but the hearing is expected to be in the next couple of weeks. PORTSMOUTH ? Already in the process of being sold to three private equity firms, Portsmouth Regional Hospital is looking to undergo a major expansion of its facility on Borthwick Avenue. The hospital has filed an application to construct 57,600 square feet of new space and renovate 85,000 square feet to its existing building, according to hospital spokeswoman Nancy Notis. The project is estimated to cost $63 million. Notis would not reveal additional details about the expansion on Tuesday, preferring to wait until Chief Executive Officer Bill Schuler addresses the issue with the press sometime today. The expansion follows a growing trend of the Seacoast region's three other major hospitals ? York Hospital, Wentworth-Douglass in Dover and Frisbie Memorial in Rochester ? all of which are planning or have recently undergone renovations or expansions to their facilities. The hospital's last major expansion featured a $33 million project from 2001-2004 to expand its cardiac unit and add a women's service center. The multiphase project included doubling the size of the emergency room in 2002 from 9,000 to 18,000 square feet and increasing the number of patient rooms from eight to 22. In 2003, the former Pavilion building was renovated and renamed the Shoals Building and is now home to the Heart and Lung Center, two new cardiac catheterization labs, a new cardiac diagnostic area, additional cardiac observation beds, improved facilities for Behavioral Health and the The Sleep Center. PORTSMOUTH ? With the Sarah Mildred Long Bridge stuck in the up position, profits are going down for local businesses along the Route 1 Bypass. "I've lost about 60 percent of business. I'm doing nothing. I'm standing here," said Rabi Jahiv, owner of the Bypass Exxon. The drawbridge that connects Portsmouth to Kittery, Maine along the Route 1 Bypass has been closed to motor vehicles since Oct. 28. Strong winds and rain over that weekend likely caused the bridge's electrical pulleys to fail and the bridge could be out of commission for up to five months as the state awaits a new part. The state has set up a barrier at the end of the bypass just before the bridge and opened up the median to create a turnaround for cars that travel down the road. It also has an extra wide area for trucks. Orange cones and an electronic arrow sign direct people to make a turn. About one dozen businesses line the corridor leading to both ends of the bridge, including several gas stations, a restaurant, a dance studio, and retail shops. Jahiv said although locals continue to conduct business at his store, sales generated through bypass traffic is gone. "We could really go out of business if it's going to go for 5 months. You can't even pay your bills," Jahiv said. He added that some representatives from the state's economic development and highway design departments were in his store recently asking if he had lost business. Department of Transportation Commissioner Carol Murray said she sympathized with the business owners' plight but business losses under current state law cannot be compensated. "Part of that is how do you determine who should be entitled to compensation," she said. "Is it just those businesses that are immediately and directly impacted or is it businesses who also rely on that road to ship their product?" Murray said the state officials constructed the turnaround to make it easier for the businesses along the road. "We're trying to make the point that the businesses are open and accessible," she said. Jahiv said he is not contemplating legal action at this point, but hoped the bridge would be back in operation sooner than five months. Fred Ouellette, a cashier at Hanscom's Truck Stop, said business has picked up a little bit from last week since the state created the U-turn, but sales were still off normal levels. Providing an example, Ouellette said on an average Monday, the store would pump around 3,000 gallons of gasoline. "We've barely even broken 1,000," he said Monday afternoon. Ouellette said he is informing all customers that come in about the U-turn to get the word out because some people are confused. "If they don't know that's a turn, they might think the bridge is open right now. Some of them are cruising by thinking that bridge is open now. I've been sitting here watching all day watching them drive by. They've been doing 50 (miles per hour)," he said. Henry Dutkowski, owner of Momma D's Casa di Pasta, said business is definitely slower than usual. He said if the bridge is closed for any length of time, it is going to take his customers awhile to adjust. "It's going to be kind of tough in January and February," he said. Dutkowski said he hoped the state would expedite the repairs and if there are not many companies that make the type of cable the state needs, consider looking outside the country to Europe. He said he would like the city and state to be more proactive in solving this problem. "I would like to think that the city or state would be a little more aggressive in helping us, rather than just showing concern if we're going to have to lay people off," he said. Murray said the state wants to focus on getting the bridge back in service. The state is exploring the option of using some surplus cable from the state of Maine. If this works, it could be a short-term fix until the state gets the proper part. The cost of the repair would probably be a little more than $1 million. The state is also looking at making a connection between the Route 1 Bypass and Market Street through the Albacore museum. PORTSMOUTH ? A prominent city developer is proposing another downtown redevelopment project for State Street. Anthony DiLorenzo is seeking approval from the Historic District Commission to demolish an existing one-story structure at 68 State St. and construct a new five-story brick building with a mixture of commercial and residential uses. DiLorenzo bought the property in July from Strawbery Banke Museum for $1,150,000, according to Rockingham County deeds records. The property, next to The Rosa Restaurant, served previously as extra exhibit space for the museum. When contacted by telephone, DiLorenzo said he is still formulating plans. "We're still looking at different scenarios in terms of what we're going to do," he said. "I think it's a great location. I like Portsmouth. Whatever we decide to do with it, I think it will be a nice piece of property to have." The first step is a work session with the Historic District Commission set for Dec. 6 at 7 p.m. He said he is also flexible on the potential height, given the commission's preferences. We're "working hand in hand with them to try come up with something (acceptable)," he said. DiLorenzo also has considered redeveloping the Meadowbrook Inn into another type of hotel use. He is still working on options for that property and expects to begin the approval process in a couple of months. EXETER -- Construction for the much anticipated Squamscott Block project is set to begin Wednesday. The construction project for the four-story 30-unit apartment building, two-story parking garage and retail space, will take place in three phases. The development is planned for Main Street, right next to Town Hall, in the heart of historic downtown Exeter. It will take roughly 12 months to complete the project. "After such a long time in gestation, it's very exciting to see this day finally arrive," said developer Nathan Szanton. Szanton built two similar projects in Portland, Maine, where his offices are based. His most recent opened Oct. 26. In October 2004, Szanton started planning the Exeter project. Over the past two years, he has appeared before the Historic District Commission, Planning Board and the Zoning Board of Adjustment. There was no shortage of debate about parking, zoning regulations and amendments, traffic impact, how affordable housing will work in Exeter, and how the building would look on one of downtown's last available lots for development. Squamscott Block will offer both market rate and affordable, work-force housing. It will include a two-story parking garage, 104 parking spaces, and ground level retail space, all designed to maintain the downtown's historic character. Construction manager for the project is North Branch Construction, of Henniker. The company's local resum? includes the new Portsmouth Public Library and the Wadleigh Falls senior housing complex in Newmarket. Rob Smith, project manager and chief executive officer of North Branch, said the biggest construction challenge is space restraints. All operations, other than brief periods next spring or fall for utility work, will be contained within the building site and should not disrupt traffic. Smith said in some cases work will be done at night to minimize traffic impact. If there were more space available, the project would probably be completed three months earlier than proposed, Smith said. The three phases of construction are:. Construction will start on Wednesday for the 14 head-in parking spaces between Town Hall and the Citizens Bank drive-through. The first phase will take two weeks. Szanton said construction will not disrupt access to the drive-through except for a few minor exceptions such as drainage work. During the rest of the construction project, bank employees will use the 14 newly created parking spaces. Once the project is complete, eight spaces will become public and six will be private. "We didn't want to disturb that area for Election Day," he said. The two-level parking structure will be built during this 90-day phase. Digging for the foundation will start right away. Retaining walls will create barriers along the Congregational Church and the bank drive-through property. Szanton said these walls are required so the surrounding land does not collapse. The first level of the parking garage will be level with Water Street. During construction, the sidewalk will be disturbed; however accommodations will be made for pedestrians. Once complete the sidewalks will be replaced. Access to the parking lot will be cut off. Temporary parking for Citizens Bank customers will be available on Center Street. Once the garage is in place the rest of the building will be constructed. This includes the residential units and retail space. The visible portion of the building on Water Street will look historic to match current construction downtown. As for Citizens Bank, spokeswoman Kathleen Reardon said the bank has been very supportive of the project as it adds much needed affordable housing downtown. "We've really worked closely with the developer and the town to ensure costumers have access to the branch for both the lobby and the drive-through during the entire construction phase," Reardon said. She said the bank also feels the completed project will result in convenient parking for customers. Once complete, apartment residents will have one assigned parking space, and six more will be available for renting. Forty spaces will be devoted to Citizens Bank employees and customers. Of those, 33 will be on the ground level closest to the bank, four on the upper level closest to the bank, and three behind the drive-through facility. Retail space will be on ground level. Four apartments will be on the second floor, and the remainder will be on the third and fourth levels. The apartment building will cover most of the parking garage creating covered parking for about two-thirds of the upper deck. Szanton said hewill not hold a ribbon-cutting ceremony for the start of the construction; rather, he'll wait until the project is complete. "I like waiting until I really deliver to have a celebration," he said. PORTSMOUTH -- Any chain store seeking to locate within the city's historic district would be required to obtain a special exception from the Zoning Board of Adjustment if a preliminary proposed ordinance is accepted by city boards. The ordinance, regulating "formula businesses" within the historic district, was forwarded to the Planning Board for recommendation after a brief council discussion Monday. A "formula business" provides a standardized array of services and merchandise, as well as logos, uniforms, architecture and layout, including restaurants, banks, retail stores, real estate offices, spas, hair and nail salons and motels, according to the ordinance definition. The ordinance in its current form would prohibit formula businesses from including drive-through windows, internally illuminated signs, corporate logos or color schemes on exterior facades or signs, any negative impact to public safety from traffic, or negative impact to the roadway from the loading area. It would also restrict the size of any such business to 2,500 square feet and street frontage to 65 feet. The draft states businesses with a standard operating plan threaten the unique identity of the historic district and an "overabundance of certain kinds of businesses can be counterproductive and otherwise detract from the appeal of both the streetscape and overall historic downtown experience." At a work session with the Planning Board in October, Assistant Mayor Tom Ferrini and Councilor Ken Smith requested the city staff create such a zoning ordinance amendment. Ferrini said Monday the request is a reflection of what the councilors heard on the campaign trail and at study circles. "We certainly at this point are in a very open stage and we want to be sure we get as much input as we can," said Ferrini. "I think there will be some pretty intense discussion down the road, as well there should be." Following a recommendation on the ordinance from the board, the council will hold readings and public hearings to get feedback from residents and business owners. The historic district in Portsmouth covers most of the downtown area, as well as parcels along much of Islington and Middle streets. Under the definition, chains like Starbucks and Subway would be required to receive a special exception before they occupy a space in the district. Ferrini said all current "formula businesses" would be grandfathered and not subject to the ordinance. 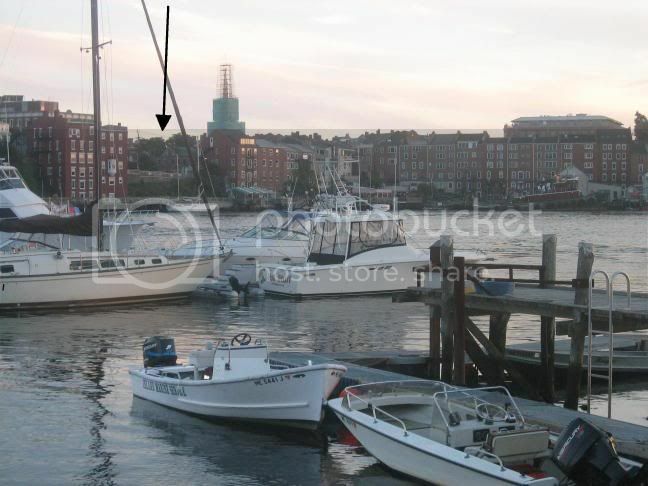 PORTSMOUTH IS home to the rarest of all small city treats: a beautiful, vibrant downtown. Some officials mistakenly think they can make it more beautiful and vibrant by banning chain stores. Like Wal-Mart and SUVs, chain stores are a favorite whipping boy of snobs, elitists and local preservationists. Any sign of a Dunkin' Donuts, GAP, or Starbucks downtown, and the commissars of taste go bonkers. But of course chain stores proliferate for one reason: people like them. And because people like them, they can draw much-needed traffic to other downtown businesses. Far from hurting downtowns, chain stores can help them. Some people thought it just horrible that Gap and Starbucks opened stores in downtown Portsmouth. But nobody complains when the people who see the Starbucks and stop there for a coffee, or come to Gap for a trendy new top, also stop at a locally owned restaurant, jewelry store or knick-knack shop. One option being considered is allowing chain stores, but banning their signs. But if tourists and passers-by can't find the stores that would draw them out of their cars, how can those stores help attract customers to neighboring businesses? It would be a real loss of local character and flavor if every store in Portsmouth's downtown were a franchise of a national chain. But that would never happen. So what is the harm if a few chain stores open downtown? Nothing. Unfortunately, some people have an impulse to impose their own tastes on others. And they often find their way onto local planning boards and councils. If they don't want to shop at chain stores, that's their right. But they should not infringe upon the rights of others by writing their own shopping tastes into local ordinances. PORTSMOUTH -- A "softened" design of the Westin hotel, conference center and public parking garage was presented to the Historic District Commission on Wednesday night. During the sixth work session with hotel developers HarborCorp LLC and representatives from Icon Architecture, HDC members said they are more satisfied with the architectural styles and details of the hotel and conference center, revised since the last work session in September, but they still have concerns about the proposed parking garage. At current design, Architect Nancy Ludwig said, the hotel will consist of 204 rooms and 21 condominiums, as well as an 11,000-square-foot ballroom facility, a restaurant, a pool and fitness facility and conference facilities. The garage is currently designed to hold 660 spaces with a main entry off Deer Street and a major entry off Maplewood Avenue. Ludwig said she took the commission's advice from the last work session and created a sense of a building, rather than a garage, by designing a more open, masonry structure with punched openings and replacing the metal look the building had previously with a wood-panelled one. The building slopes on one side -- a necessary slope to make the transition from floor to floor, she said. While Ludwig said this creates a softer, more consistent structure in fitting with the rest of the building, the commission is worried about the impact this open and sloped structure will have on the buildings located behind it -- what is currently the Portsmouth Herald location. "In order for us as a design review board to buy into something like that, we have to assume that what's going to happen across the street is going to be large, massive and somewhat industrial," said Chairman John Rice. "My crystal ball isn't working for what's going to happen on the other side, but I would hate to think it is going to be composed of large industrial buildings. I dream of pedestrian-friendly streets," said David Adams. Richard Katz said while there are design elements he may not particularly like, he does not feel it is his function to like them. "It is my function to decide whether they are appropriate to the area. Do they do any damage to the historic concept of Portsmouth and its identity? I tend to think not," he said. "It's a parking garage. I don't want you to put up something that says this is something it is not. I see an integrity in this design and this elevation, so I do not have an objection to it and I accept it for what it is." Since the parking garage will become property of the city of Portsmouth upon completion, Icon Architecture representatives said these concerns will be taken into consideration so the structure will be of a design and function acceptable to the city. DOVER ? A professional office building a developer is seeking to build near Exit 9 and Liberty Mutual is going to be big ? 80,000-square-feet, four-story big ? but its potential tenant remains a mystery so far to city officials. The building would be built at the end of Indian Brook Drive and its employees would only be able to access the facility from Members Way. The structure will encompass approximately 5 acres and contain an underground parking facility for 414 cars. It is not unusual for major projects of this size to not release the name of the projected tenant until final city approval. The project will sit on portions of properties owned by three separate entities ? Mo Y. Wong; Davis, Bartol Erikson Holdings, LLC (The New England Equine Hospital); and Northeast Credit Union. Taken together the three pieces will create a new piece of property totaling 4.833 acres. "Strategically placed at Exit 9, the gateway to the area's premier officer corridor, this landmark building will join the ranks of Liberty Mutual Insurance Company and Measured Progress," wrote Bob Stowell, president of Tritech Engineering Corp., in his application letter to the city. Stowell is representing Summit Land Development. "The building will consist of 80,000 square feet of class "A" office space encompassing four stories and incorporating an underground parking facility. Total parking will accommodate 414 cars," Stowell wrote. During an interview Tuesday, Stowell declined to provide specifics about the identity of the company involved, but he did confirm it was a "local" one. City Manager Mike Joyal said he did not know which company will use the building, but added he is very interested in finding out. The city will begin to consider approving the project during a Technical Review Committee Meeting scheduled for Thursday, Dec. 28 and then, likely, during the Planning Board's full Jan. 9 meeting. Dover needs to stop focusing so much on Weeks crossing and push it downtown, there are a number of parking lots which could go away very quickly and greatly improve the walkability and urbanness of downtown. and am I the only one that wants to Kick Liberty Mutual for not having a nice mid rise/ small high rise in downtown Portsmouth, the Northern Tier could be like the LM complex, they have TONS of office space in Dover, Newington/Portsmouth, well over a million square feet I would say, and yet its all in office parks. Those Bastards. The cap might be around four or five stories, because not much taller is built there. I think the downtown height restriction is in the ballpark of 50 feet. They're trying to pass a 40 foot restriction for the waterfront now. Waterfront: How tall is too tall? Yea its 50 ft, though there are a number of 60 and 70 plus foot buildings that may have been pre-height limit and or got special okays from the board. Regardless, the northern tier could use some height, I think they should try and make a mini Canary Wharf, downtown is close to being walled out, and I think it would do some good to get some major hubs of business/ living in the area. I have been meaning to write to someone about it, one way or the other, they are going to need to do something to maintain growth without razing historic blocks which they want to keep. ^For some strange reason, the Northern tier is considered part of the historic district which has those strict design and height rules. This is despite the fact that this area has no real historic value. They've talked about easing up the restrictions, letting more modern and taller buildings in but I'm not sure anything came of it. The Northern tier actually used to be an old ethnic neighborhood, Portsmouth's 'Little Italy' before it was all torn down by the federal gov't as part of an urban renewal project in 1969. Accross from the Hilton is a cluster of 13 historic buildings called "The Hill" which are the only buildings that were saved from the project. I'm going to be staying in Downtown Portsmouth for the holidays.... anyone have any suggestions of good places to eat & drink?